Utagawa Kunisada (1786–1864), Shokunin (Artisans). Woodblock print triptych showing the process of printmaking, 1857. Thanks to the refined technique of woodblock printing, Japanese society during the Edo period (1615–1868) enjoyed a rich supply of books and pamphlets, pictures and artworks. 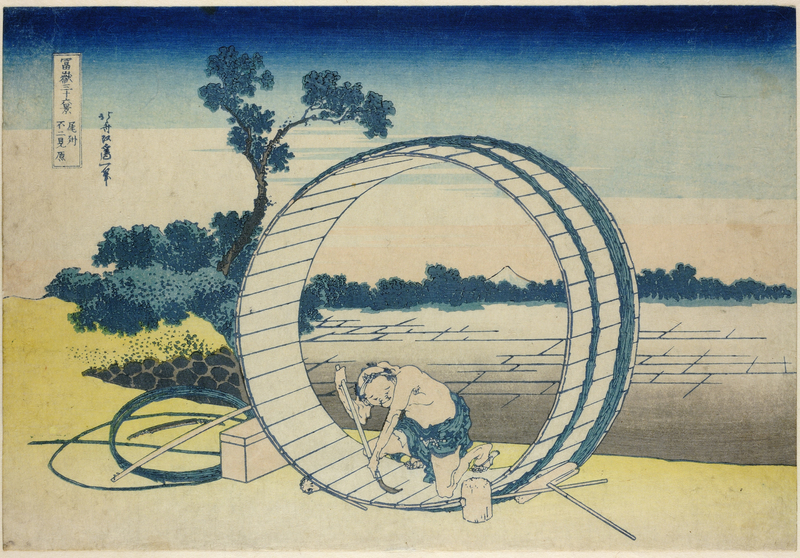 The technique is particularly associated with pictures of the ‘floating world’ (ukiyo-e) – those celebrated, full-colour depictions of courtesans, actors and famous places that collectors have long admired and that the Impressionists embraced as a source of inspiration. 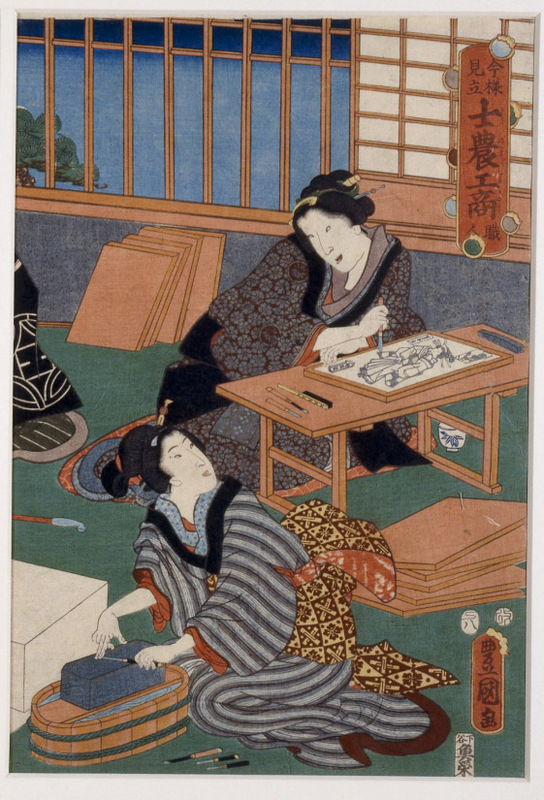 Utagawa Kunisada (1786–1864), Shokunin (Artisans). Woodblock print showing the process of printmaking, 1857. In the free Asahi Shimbun Display Japanese woodblock printing: a craft of precision, we’ve used the work of three different ukiyo-e artists to reveal the skill and craftsmanship that went in to creating a traditional Japanese woodblock print. 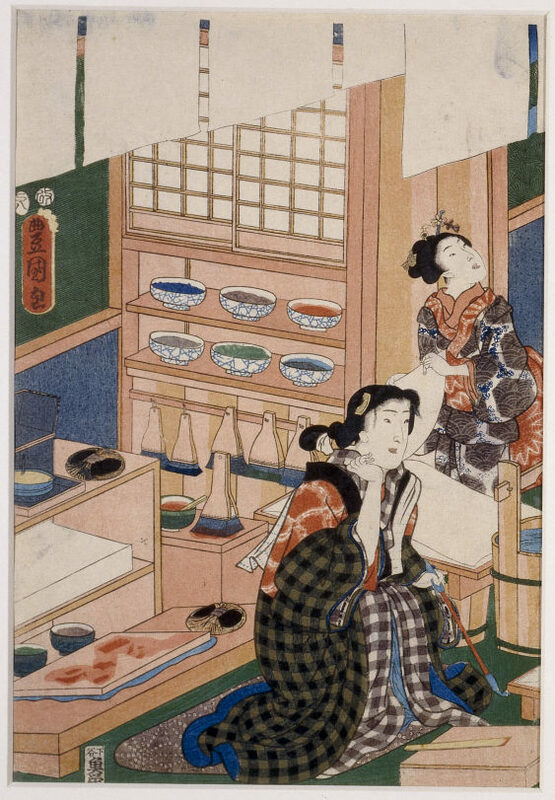 Featured in the display is a full-colour triptych by Utagawa Kunisada (1786–1864). It offers a look into the workshops of a master block cutter and master printer. Kunisada takes us through the main stages of the woodblock printing process – from the cutting of the first outline woodblock through to printing on specially prepared mulberry-fibre paper. Also on display is a rare brush-drawing that Katsushika Hokusai (1760–1849) completed for a print. An artist’s final brush-drawing (or ‘block-ready drawing’) initiated the printmaking process, but few examples survive. They were usually pasted onto a woodblock and destroyed as the master block cutter traced the artist’s lines onto the block with a chisel. The master cut along either side of the lines, and then removed the surrounding wood to leave a network of raised ridges – the outlines of the final print. 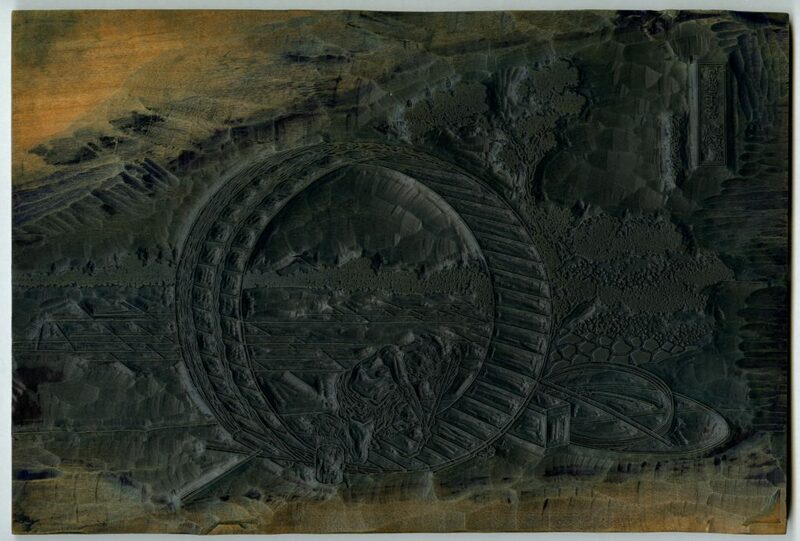 Carved woodblock for a modern reproduction of Fuji-view Moor in Owari Province, from the series Thirty-six Views of Mt. Fuji, by Katsushika Hokusai. A standard colour print might require four of five woodblocks cut on both sides, while a specially commissioned print (surimono) might require ten or more blocks. Mountain cherry (yamazakura) was, and still is, the wood of choice for the process because its grain is dense and durable. The woodblock we’ve used in the display is a modern example, but examples of original ukiyo-e woodblocks are very similar – the technique has changed little since the time of Hokusai and Kunisada. Katsushika Hokusai (1760–1849). Fuji-view Moor in Owari Province. Colour woodblock, 1830–1833. The pigments in traditional Japanese prints came from different sources. Many were derived from plants, such as safflower for red, and others from minerals. Around the late 1820s, the synthetic pigment Prussian blue (bero-ai) caused a sensation when it became widely available as it was a stable and lightfast pigment that resisted fading over time. The initial designs in Hokusai’s famous series Thirty-six Views of Mt Fuji (1831–33) were printed solely in Prussian blue and indigo. Subsequent designs, including the iconic Great Wave (1831), began to incorporate other colours. Utagawa Hiroshige (1797–1858), No 46, Shono haku-u. Colour woodblock, c. 1833–1834. Master printers combined basic pigments to create a range of colours, and they were also skilled at creating special effects. 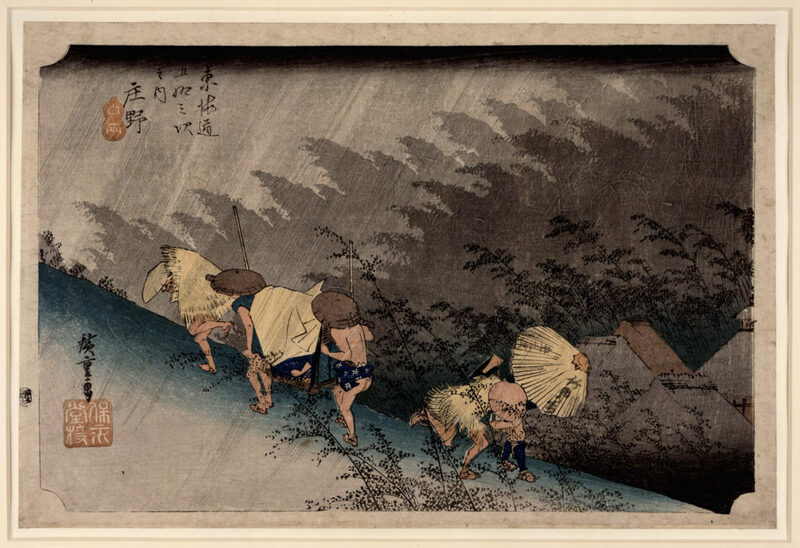 For example, the rain-drenched scene Sudden Shower at Shōno by Utagawa Hiroshige (1797–1858) includes a beautiful example of a favourite printing technique – gradation (bokashi). This was used by artists to suggest depth and atmosphere. Gradation required the printer to wipe pigment from the woodblock in a controlled manner, bringing to life the range of tones in the artist’s original design. 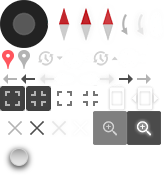 The process had to be done by hand, so no two examples of gradation are exactly alike. The display shows how the exquisite detail and colour of Japanese woodblock printing was achieved, by revealing the little-known processes behind this beautiful art form. The Asahi Shimbun Display Japanese woodblock printing: a craft of precision is free and in Room 3 until 16 July 2017.